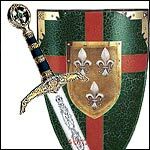 Marto European Western Swords- Replica & Historical swords of Europe and the Americas. Marto Medieval Accessories - Personal and Gift items, such as: Zippos, Pens, Magnifying Glasses, Wine Openers, Wall Plaques and Gift Sets. Marto Miniature Shields are small replicas of historical shields.